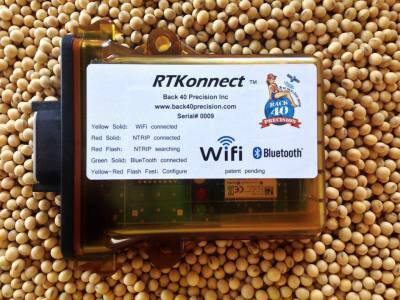 The RTKonnect ® is an industry exclusive NTRIP client device that utilizes both WiFi & BluetoothTM as well as SerialIP for easy in cab connectivity. In most cases this replaces the use of a modem and extra data plan. Share data with your family cell phone plan. Use the RTKonnect with any 802.11b/g WiFi hot spot access point! including those offered by cellular phone providers. The internal NTRIP Client can automatically log into your internet based RTK data source and begin streaming RTK corrections to your receiver. Connect to your server by NTRIP, simple TCP, SerialIP, and even connect a FM radio to the 2nd serial port. Option to connect only if GNSS receiver has a position. Option to turn the backup manual GGA message on or off. Improved login function when connecting to a slow to respond server. Option to output to transmit radio for local rebroadcast. Multiple serial port baud rates to match receiver capabilities. Use the BlueTooth connection with Android or Windows apps to connect with your cell phone as your NTRIP client. The RTKonnect ® works with nearly all RTK capable receivers including CNH CaseIH New Holland 252, 262, 372 with NAV2 steering, AgLeader / Autofarm Paradyme, Geosteer, 2500, GPS 6500, Trimble CFX750, FMX, FM1000, EZ-Guide 500, Novatel SmartL-6, MR10/MR15, Raven Phoenix 300 and 600S, Septentrio, Javad, Novariant, TopCon AGI4, AGCO AG3000, ComNav Tech, CHC Nav, and others. WiFi and Bluetooth both have greater than 60ft range.